"Our students can learn the concepts of green development from special designs." The designs Tang talks of are found in a rural school that looks vastly different to most other primary schools. For a start, a running track it has is on a roof to save space, and there is a 3,000-square-meter vegetable garden in the center of the campus. The campus uses a natural lighting system and a ground heat exchange system to save energy, and water from surrounding wetlands is purified and made potable. In short, over the past few decades New Jindai Primary School has been transformed into a national model of sustainable development and education. It has 553 students and 36 teachers and every classroom is linked to the internet. However, when the school was established in 1966 conditions were so poor that students had to study at a tiny temple, sitting on broken wooden benches. The school has been moved three times, the first of these being from the temple to a decent campus in 1994. "Thanks to reform and opening-up in 1978, our school has received more funding and support," Yang says. After school buildings were greatly damaged in the Sichuan earthquake of 2008, it received a 21 million yuan ($3 million) grant from the local government, Sino-US Sustainable Development Center, China Soong Ching Ling Foundation and China Environmental Protection Foundation to build a new campus, which needed to be safe, economical and sustainable. To realize the goal, the school invited architects from Tongji University in Shanghai, which boasts of having the best architecture department in China, to design the new campus. 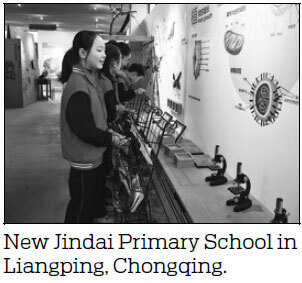 On April 5, 2011, the students moved into the new Jindai school. "The architects did not change the original landscape of the place, and they turned the large hilly field into a vegetable garden, which is now a great place for our students," Yang says. Every class has a plot in the garden, in which students can learn how to plant vegetables there and observe how plants grow. "These days most rural children do not know how to farm as their parents did, and this garden provides them with great opportunities to learn agriculture," Yang says. 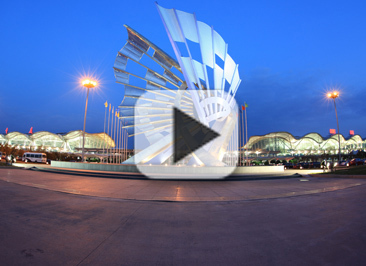 With the aid of the campus' special features, the school has developed many programs on scientific technology education. Based on students' daily lives and real work they are required to learn about environment protection and sustainable development, Yang says. The school has started an annual campaign to encourage people to use energy-saving light bulbs, during which students can bring traditional bulbs from home and exchange them for energy-saving ones. In an annual technology festival, students also make use of waste newspaper and bottles to create pieces of arts, and thanks to these technology education programs, the students have won prizes in local scientific competitions. In order to promote green development to more people, the school also opens its gate to locals and encourages them to take part in its programs.